There are also european models and US-versions. They differ sometimes in extras, overall gearing and power. Until not explicitly said otherwise, the information presented on this site refers to the european models. The 830i was conceived as the entry model of the 8 series. 18 prototypes have been built and all of them were destroyed again. None of the 830s has ever been ready for production let alone for sale. BMW will not disclose the type of engine used in those prototypes. Only two years after its introduction in 1992 the 850i's sales numbers dropped by two thirds, BMW had to make the 8 series more attractive. Along with the 850CSi as the sport version (not advertised as an M car) there had to come an entry model. After the 830i proved to be improperly motorized, the four-liter M60 engine was selected. 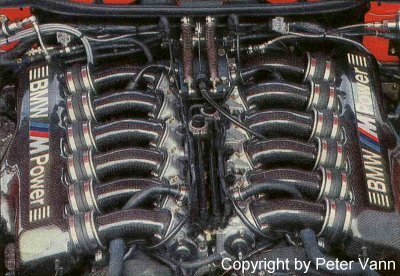 The 840Ci got an engine upgrade in 1995. It appears that both engines were available in 1995 and 1996 at the same time. The new M62 engine did not only have more torque but it didn't have the old M60's problems with american high-sulfur fuel which caused many problems until then. The 840Ci was available with a 5-speed automatic or a 6-speed manual gearbox in Europe. In the United States there was only the 5-speed automatic transmission. Here you will find detailed technical data. At the time of its introduction in the beginning of the 1990s it was one of the, if not the advanced car of its time. For the first time there was a twelve-cylinder engine available with a six-speed manual gearbox. New as well was the seat-integrated retaining-system, the integral rear axle (which got perfected in the 850CSi) and the still unique integration of low beams, high beams and fog lights - three lamps - into pop-up headlights. The 850i was available with either a 4-speed automatic or a 6-speed manual gearbox. It is quite tricky to distinguish between the 850i and the 850Ci. You can read from the production table that production of these two models was overlapping for eight months. And the upgrade to the advanced M73 engine did not coincide with the change in the type designation. In addition even material from BMW contradicts itself. You can read in the owner's handbook of a '93 850CSi that the 850Ci has a 300hp engine (the M70). 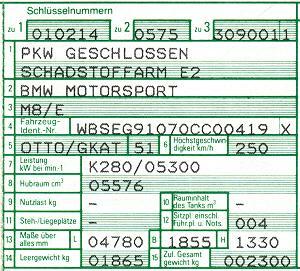 According to BMW production figures the 850Ci does only exist since the M73 engine with 326hp was built into it (1994). The 850Ci with M70 engine was available with a 4-speed automatic or a 6-speed manual transmission, the 850Ci with M73 power plant only with the 5-speed automatic gearbox. So there are no 5.4l 850s that are manual. With the introduction of the 850CSi BMW added the shortcut C (for Coupé) to all their coupés. The 850i became the 850Ci. The additional S in CSi means sport. Maybe that should remind of the 635CSi. In order to avoid any misunderstandings, the 850 with the M70 engine and 300hp will be called 850i on this website, and the version with 326hp and the M73 engine 850Ci accordingly! Since 01/1993 leather seats became standard, the adaptive 4-speed automatic, folding rear seat backs and the ski bag were introduced. As expected, the 850CSi makes no exception in having several names. In this case, the term M8 is mentionned on and on again. And it's correct. The 850CSi is a real M-car. It does not only have an M-bred engine (type S70, the S indicates M-origin) but has been manufactured by BMW M as well, according to the VIN which starts with WBS (BMW Motorsport) instead of WBA (BMW AG). This is mentionned in the papers as well. But although the papers say that the correct model name is BMW M8, the car has been enhanced only moderately by the M-Division, compared to the real M8, which remained a prototype only. Only 1510 units of the BMW 850CSi were built from August 1992 until october 1996. Because of stricter emission guidelines from January 1997 on, the production of the 850CSi ceased as further development, because of the few cars sold, would have been too expensive. So it has the same destiny as the Aston Martin V8 Vantage. By the end of 1996, all dealers still having a CSi, were instructed to license them - and if it was for one day only - because with the new guidelines it would have been impossible to do. Maybe what makes the 850CSi most special was the Active Rear-Axle Kinematics system which was standard on all Euro CSis. It's abbreviation (AHK) is the abbreviation of the german expression for it (Aktive Hinterachs-Kinematik). While normal passively steering rear axles allow the wheels to be slightly turned by the forces acting on them when cornering, the hydraulics of the AHK turns in the rear wheels before those forces build up. The AHK is therefore a real for-wheel-steering system! From a speed of about 60 kph (37 mph, BMW doesn't disclose the correct numbers) and up, a computer controlled hydraulic system steers the rear wheels depending on the turn angle of the front wheels. All four wheels then turn into the same direction, minimize weight shifts (the CSi weighing almost two tons even beats Turbo-Porsches in lane change maneouvers) and even allow steering adjustment in a curve to an extent that would inevitably cause you to crash in any other car. According to various sources the maximum angle the rear wheels turn is between 1.5 and 2.5 degrees (again, BMW doesn't tell). With the introduction of the CSi the Active Rear-Axle Kinematic was also on the option list for the normal 8 series. But the additional amount of money you had to pay was 6400 Euros (DEM 12500), so a non-CSi with AHK will belong to the rarest things on this planet. The Alpina coupé are tuned 8 series cars taken from the normal production lines. Their number is included in the production- and shipment figures. So they do not add to the total number of 8 series cars. The Alpina B12 5.0 Coupé is based on the 850i and was available with the 4-speed automatic gearbox only. The Alpina B12 5.7 Coupé is based on the 850CSi and was available with 6-speed manual transmission only.